People in several countries stopped in their tracks today to be wowed by a total solar eclipse that plunged a narrow swath of the planet into daytime darkness. The eclipse's path began in Brazil and extended across the Atlantic Ocean, northern Africa, and central Asia, ending at sunset in northern Mongolia. From Ghana to Libya and Syria, schools closed and streets emptied. 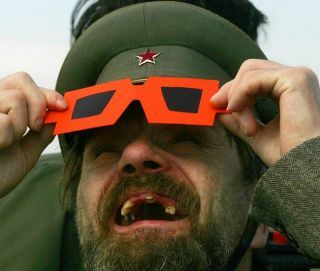 "It's fantastic,'' said Joaquim Boix, who traveled from Barcelona to view the eclipse in Turkey. "It's the color, the metallic blue-green color on the skin of the people. The sky with the stars in the background. Usually you watch the stars in a black background ... The background is blue. It's a special feeling. Automatic street lights flickered on in Ghana. Authorities sounded whistles and schoolchildren burst into applause across the country's capital, Accra. Many people in the deeply religious country of Christians and Muslims said the phenomenon bolstered their faith. Solar eclipses occur when the Moon gets directly between the Sun and Earth. They are relatively infrequent because the Moon orbits Earth in a slightly different plane compared to the Earth's travels around the Sun. Astronauts Bill McArthur and Valery Tokarev aboard the International Space Station had a clear view of today's event, and used cameras mounted to the spacecraft's exterior to observe the eclipse. Superstition accompanied this eclipse's path, as it has for generations. One Indian paper advised pregnant women not to go outside during the eclipse to avoid having a blind baby or one with a cleft lip. Food cooked before the eclipse should be thrown out afterward because it will be impure and those who are holding a knife or ax during the eclipse will cut themselves, the Hindustan Times added. In Turkey's earthquake-prone Tokat province, residents set up tents outside despite assurances from scientists that there was no evidence of any link between eclipses and tremors. The next total solar eclipse, on Aug. 1, 2008, will occur northern Canada, Greenland, Siberia, Mongolia and northern China. The next total solar eclipse visible from the United States will be Aug. 21, 2017.